Volkswagen introduces the Passat Wolfsburg Edition for the 2013 model year. This version includes 16-inch alloy wheels, perforated leatherette upholstery, a power driver’s seat, heated front seats, satellite radio, and a Media Device-Interface (MDI) with an iPod cable. Otherwise, the Passat SE adds a new center console with rear air vents, while the Passat SEL gets a standard reversing camera. The 2013 Volkswagen Passat family sedan may be outfitted in S, Wolfsburg Edition, SE, SEL, and SEL Premium trim levels. The standard features list includes Bluetooth connectivity with music streaming capability, cruise control, and power windows, door locks, and side mirrors, among other items. The new Wolfsburg Edition adds aluminum wheels, leatherette upholstery, a power driver’s seat, heated front seats, satellite radio, and an iPod cable. To that, the Passat SE adds wood interior trim and an upgraded touchscreen stereo with HD Radio and satellite radio. The Passat TDI SE includes 17-inch aluminum wheels. Next up is the Passat SEL, which features a power sunroof, a navigation system, a reversing camera, and upgraded interior lighting. At the top of the lineup, the Passat SEL Premium adds leather seats, driver memory settings, keyless entry and push-button start, and fog lights. The 2013 Passat is equipped with a standard 170-horsepower, 2.5-liter inline 5-cylinder engine. The Passat S has a 5-speed manual transmission, with a 6-speed automatic transmission available as an option. All other Passats equipped with the 2.5-liter engine have the automatic as standard equipment. The Passat SE and SEL are available with a 280-horsepower, 3.6-liter V-6 engine paired with a 6-speed Direct Shift Gearbox (DSG) automated manual transmission with paddle shifters. Looking for greater fuel economy? Passat TDI models have a turbocharged, 2.0-liter clean diesel 4-cylinder engine than makes plenty of torque for a car of this size. A 6-speed manual gearbox is standard, with the 6-speed DSG optional. 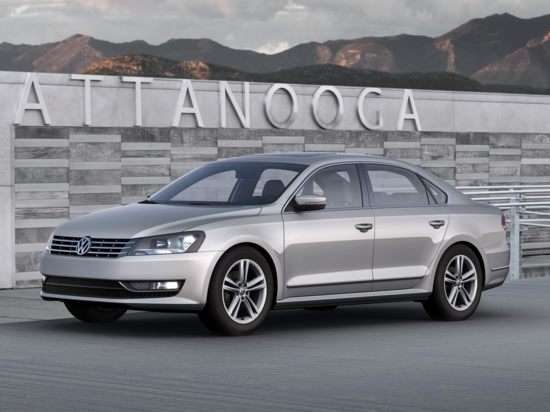 The EPA says that the 2013 Passat with the 2.5-liter 5-cylinder engine will return between 22 mpg in the city and 32 mpg on the highway, while the 3.6-liter V-6 with the DSG produces 20-mpg city/28-mpg highway. For true fuel-economy nirvana check out the Passat TDI, which gets between 30 mpg in the city and 43 mpg on the highway. The National Highway Traffic Safety Administration (NHTSA) says the 2013 Passat achieves an overall crash-test rating of 5 stars. The Insurance Institute for Highway Safety (IIHS) gives the Passat a “Top Safety Pick +” rating. The “+” reflects the Passat’s “Acceptable” rating in the tough new small overlap frontal impact crash-test. An Intelligent Crash Response system unlocks the Passat’s doors, activates the hazard lights, and shuts off the fuel pump after the airbags have deployed in a collision. Otherwise, aside from a touchscreen radio, a navigation system, and a reversing camera, the Passat is lacking in the technology department.